Hello Everyone and welcome to a new year of posts from Hedley Park students. A big welcome to new parents, friends and relations to our blog about activities, fun and life at Hedley Park Montessori School. If you have been reading our blog for the past few years welcome back, we are glad to update you on our new year back at school. We will “catch you up” on all our fun from the super sunny summer term we had, apologies but we were too busy outside enjoying the term to sit inside and update the blog, but we are sure you will forgive us. In the next few weeks we will re-live the sunny days with you and bring back a sunbeam or two of the activities, trips, projects and sports we were involved in. For now we wanted to share with you a tiny sample of the work our Senior Class have been doing on a daily basis. We are loving our work journals, following the plan of work agreed with our teacher and having control over what we do and when. We are getting more done than ever before. 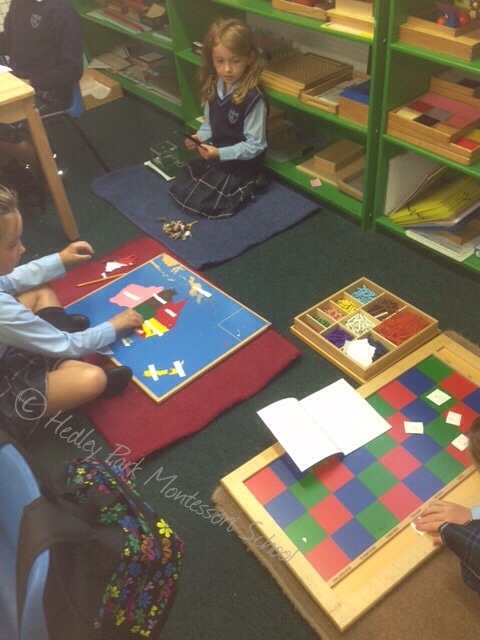 We have said this before but what is truly extraordinary with Montessori education is the independence and love of their own learning students get from the way the method works. Giving students the ability to work out their learning journey with their teacher, inspiring them to delve into subjects in a way they would never have had the opportunity to do, in a group learning environment. Our Senior students love projects, they love the breath of learning they encompass, and like all confident learners they love displaying their knowledge to their peers. But it’s the daily learning, at their own pace, quietly and unassisted (unless requested by the student) where they grow into effective and self motivated people. Of course this is best witnessed in the multi age groupings that also characterise the Montessori classroom. Younger students looking on as their older classmates work on complex materials, knowing that the piece of material they are perfecting will lead them to the work the older children are doing gives them a sense of progression and belonging. It’s not just the younger students that benefit from the multi age grouping. Older children gain a sense of confidence and responsibility as they assist the younger learner with an aspect of the material they are competing. Helping the younger students is a form of revision and helps to illustrate to the older students how each material fits into the bigger picture of their journey. Here are a few more photos of our Senior Class at work!